To say I was a picker when picking wasn't cool would be an understatement although I have never been blessed with enough money or space to indulge my tendency. Even as a teenager I was always on the lookout for just the right piece to add to my growing collection. Daddy came home from work one day with the object of my latest search in the trunk of his car. The antique Victrola had been refinished but it was in working order and it only cost $8.00. It even had a stack of records inside. That's how I discovered a whole new genre of music that had never caught my attention before. (I think that was during my folk singing days.) There were a couple of Bessie Smith records. She was famous enough even I had heard of her. I knew who Ethel Waters was. She was the sweet older lady who sang HIS EYE IS ON THE SPARROW at the Billy Graham Crusades. But as I played those 78s, I began to notice the piano player on all the records was the same guy and there were some very fancy runs there. His name was listed on the labels so I did some research to find out he was the grandfather of one of THE MOD SQUAD! 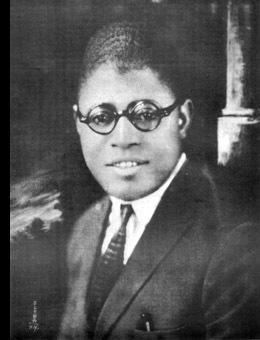 Clarence Williams was born October 8, 1893 or October 6. 1898 (depending upon which source you believe) in Plaquemine, Louisiana (on the outskirts of New Orleans) of Choctaw and Creole heritage. He performed at his family's hotel and sang in the streets until he left home at the age of twelve to join Billy Kersand's Minstrel Show as a singer. He soon became the Master of Ceremonies for the troupe. Upon returning to New Orleans, he began the first of several businesses he would own, a suit cleaning service for the many stylish piano professors in that town. He began playing piano in the honkytonks of Storyville and soon became a well known entertainer. He was a great businessman who worked as an arranger and managed entertainment at the local African American vaudeville theater as well as several saloons and dance halls around Rampart Street and clubs in Storyville. He started a publishing business with Armand Piron, writer of I WISH I COULD SHIMMY LIKE MY SISTER KATE, and wrote his first money making song BROWNSKIN, WHO YOU FOR?. He received $1,600.00 for the song. According to him, that was the most anyone in New Orleans had ever received for a song. They formed a vaudeville act with Piron on violin and Williams on piano and vocals. The duo became acquainted with W. C. Handy who helped them get some of their compositions in Memphis music stores. Williams was never a humble man and claimed to be the first writer to use the word "jazz" on his sheet music. His business card called him "The Originator of Jazz and Boogie Woogie". He moved to Chicago in 1920 and opened a very successful music store which soon grew into three music stores. He jumped on the new-found popularity of female black singers and made quite a profit from selling recordings of them. He married blues singer Eva Taylor, one of the first females blues singers ever heard on the radio. They began writing songs together including the hit MAY WE MEET AGAIN a tribute to Florence Mills one of the most popular black stage entertainers of the time. 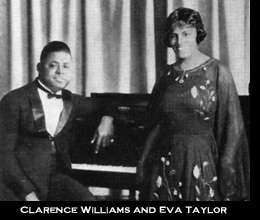 Clarence sold his Chicago stores in 1923 and moved to New York. He opened offices in the Gaiety Theater and became one of the primary pianists on scores of blues records made in New York during the 1920s. He supervised African-American recordings (the 800 Race Series) for the New York office of Okeh Records and recruited many of the artists who performed on that label. He also recorded on Columbia and other record labels with studio bands. While he (like other agents) was known for taking advantage of new artists, he also helped launch or furthered the careers of many other successful stars including Fats Waller and Louis Armstrong. During the 20s and 30s, he was a very prolific producer organizing at least two sessions a month for other artists and recording over 300 songs under his own name on different labels. His name appears as writer or co-writer on numerous songs including some by other composers. It was common practice during that time to purchase songs written by others and put the purchasers name on the final product. Admittedly, Williams did that on many occasions. He is even credited with writing Hank Williams' 1947 hit MY BUCKETS GOT A HOLE IN IT. In 1927, he decided to try musical theater. He wrote the book, music, and produced the show BOTTOMLAND. His wife Eva was cast in the lead role. The show was not a critical success. His New York publishing company continued to prosper until 1943 when he sold its catalog over over 2000 songs to Decca for $50,000. That doesn't sound like much by today's standards but then it was quite a lot. He tried to retire but soon bought a used goods store. He continued to write songs until he lost his sight after being hit by a cab in 1956. Clarence Williams passed away on November 6, 1965 and was buried in Saint Charles Cemetery in Farmingdale on Long Island. He was the father of singer-actress Irene Williams and the grandfather of MOD SQUAD actor Clarence Williams III. He was inducted into the Songwriters Hall of Fame in 1970. He may have sometimes been quite a "rascal" but he was a prolific writer, a shrewd businessman and he had magic fingers!